Printed on a lightly textured 310GSM art paper using the latest environmental water based inks on a state of the art 8 colour machine. We asked ©opyKat to do what she does best, and she delivered! We wanted a set of nine letters which we placed randomly around town for the general public to pick up and keep, if they were clever enough. Each print is signed and hand numbered by ©opyKat, Limited Edition of only 5 in each letter so grab them quick! 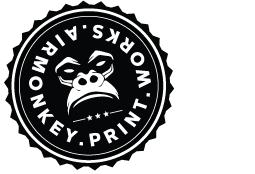 If you are interested in purchasing the full AIRMONKEY then please drop us an email quickly, I'm sure we can sort out a discount!